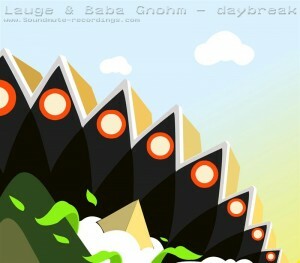 Originally released on Soundmute Recordings in 2009, Daybreak is the first collection of songs from Danish downtempo duo Lauge & Baba Gnohm (Henrik Laugesen & Kalle Christensen). Their style is deep and dreamy Scandinavian chill out with glacial rhythms, blissful atmospheres, and emotive melodic flourishes. Bass on track 3 by Mikkel Govertz. Artwork by Mark Duckert. MP3 Download | FLAC Download | WAV Download · Download count: 5,979.
simply wonderful! Thanks for the good vibes! My download says “… – 2009”? Is that just me? (FLAC). The album was originally released in 2009. Hope this helps! Thanks for making this vibes! @-C-C-, description explains it all. Thanks for releasing this awesome piece of chillout music for free! Aah thanks for the answers! Should have read the description. This is really relaxed stuff, nice vibe. Drum production is really basic and rigid, though, sounds are too dry and the same loop continues for the whole track. This is an amazing piece of work, thanks! I love it!